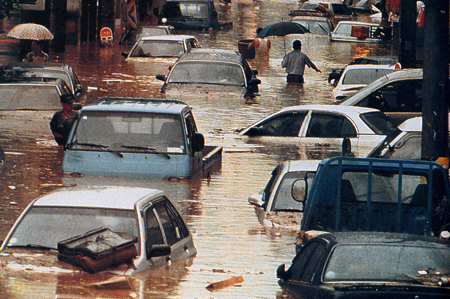 The question of how to respond to the impact of flooding, was the focus at “Sustainable Design Week“, concerned with “Design for Disaster” in 2005, at the “Design Academy Eindhoven“, the Netherlands. The everyday object, a bench, can be manipulated in such a way that during flooding, it can float and be used as a boat. A bench made of a sustainable material of light weight such as, recycled polypropylene, will meet this design demand. By applying graphics to the bench, it is possible to raise awareness of dangers such as flooding or tsunamis.